While we ready for this fascinating journey through a very tiny, yet gigantic region, we wonder, “How can such a small place have so much to offer?” A part of Italy’s Mezzogiorno that is still little known to mass tourism, Basilicata is blossoming these days. And one of its most beautiful cities. 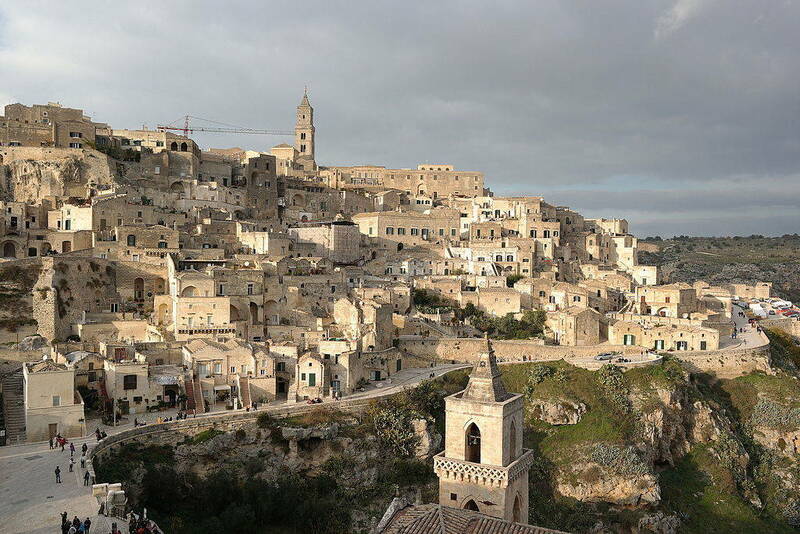 And Matera, capital of Basilicata, as you probably know, has been chosen as the European Capital of Culture for 2019. So 2019 will be a special year for this beautiful, unique city. Let’s pick up where we left off, in search of the wonders of the Bel Paese, from the plains of Tavoliere della Puglia, a stopping place for the ancient transhumance from Abruzzo, to Candela, terminus of one of the five Abruzzese cattle tracks where flocks were herded from Pescasseroli across the steamy plains of Apulia. After the road out of Candela sets us down gently in Basilicata, it branches out into pastureland before rising again around Melfi, the first of many jewels that awaits travelers in this petite region. Melfi is a rather stunning apparition, what with its magnificent Norman Castle fortified by bulwarks. The castle dominates the old medieval center, which drops steeply down toward the imposing city walls and its many towers. One of the biggest attractions in the region, the castle has been the site of major historical events, including the proclamation of the Melfi Constitution, the handiwork of the Swabian Emperor Frederick II, stupor mundi himself. The constitution laid out a series of laws whose judicial wisdom never ceases to astonish, even today. Later, the Angioini family turned the castle into the official residence of Maria of Hungary, wife of King Charles II of Anjou. Under Aragon rule, the castle was passed on to the Caracciolo family and later to Prince Andrea Doria, whose descendants looked after the place until 1950. For the first two centuries after the year 1000, it served as the seat of as many as five councils. here for a few years before moving to Rome. An interesting ancient archaeological park, Venusia, contains baths, an amphitheater, and an entire neighborhood of well-preserved Roman houses (or domae). The Castello Pirro del Balzo is also a magnificent site. hill. First Norman and later Swabian, the castle was a second home to Frederick II and his son Manfredi. During the latter half of the 1800s, after the unification of Italy, the castle was used as a hideout for Carmine Crocco, the famous brigand of Basilicata, who played a major role in that social phenomenon and was later put down by the militias of the House of Savoy. Just beyond a snaking tract of road, we arrive at the foot of a hill dominated by the urban sprawl of Potenza, Basilicata’s beautiful capital city. Standing at an intrepid altitude of 819 meters, or 2700 feet, the city is distinguished by its ancient history and monumental architecture. Alas, our travel diary can’t do justice to the place, which deserves a lot more attention, so instead we’ll hop on the ring road running south around the hill, and from there exit onto the Basentana highway. The arterial road, so-called because it follows the course of the river Basento before reaching the Ionian Sea, runs continuously downhill for over 60 miles, all the way to Metaponto, also known as the California of Italy. Gullies of yellow broom and thriving fluvial vegetation grow alongside the road that winds through the valley, here narrow – see, for example, the area around Pietrapertosa, a town hanging at a dizzying angle off the right side of the hill, below sharp rocky cliffs – Basilicata’s version of the Dolomites – and there wide, with a range of small cities and lovely villages perched atop the summits on either side of the Basento valley. Tricarico, Grassano, Grottole, Ferrandina, Pisticci. 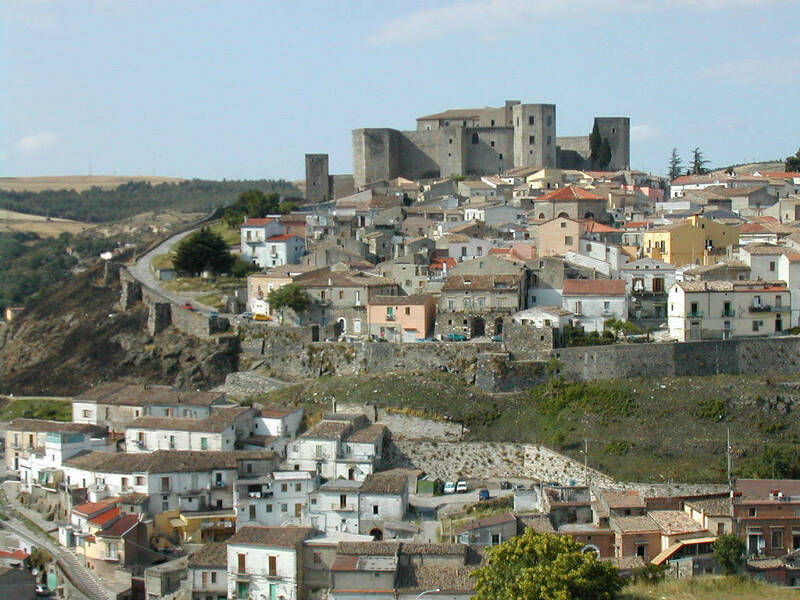 High up on the left is Bernalda and its beautiful Castello Aragonese, which may originally have been a Norman castle. A marvelous city with almost 13,000 inhabitants, Bernalda boasts an orderly network of paved streets and charming buildings. One mile- and-a-half-long avenue, with broad sidewalks decked out with plants and flowers, runs the length of the city, past the Churches of San Donato and the Chiesa Madre dedicated to Saint Bernardino da Siena. Because the Franciscan friar is patron saint of both cities, Bernalda is twinned with L’Aquila, where the saint used to preach and where, on 20 May 1444, he chose to die. Bernalda is also twinned with Siena and Massa Marittima, the latter the place of his birth. In August the festival of San Bernardino is an extraordinary gathering of the people of Bernalda as well as its many visitors who come for the amenities of the lido di Metaponto, the beach nestled between the Bradano and Basento outlets, between a pearly sea and a splendid green river belt, the epitome of the Mediterranean. The city is also home to the grandparents of Francis Ford Coppola. The famous director and his daughter Sofia so love the city that they have opened a resort and other hotels in the area. The resorts and campgrounds on the lido are friendly and in good order, while the remains of an early Greek settlement, a place where Pythagoras brought his school of philosophy, continue to draw tourists thanks to their cultural importance. 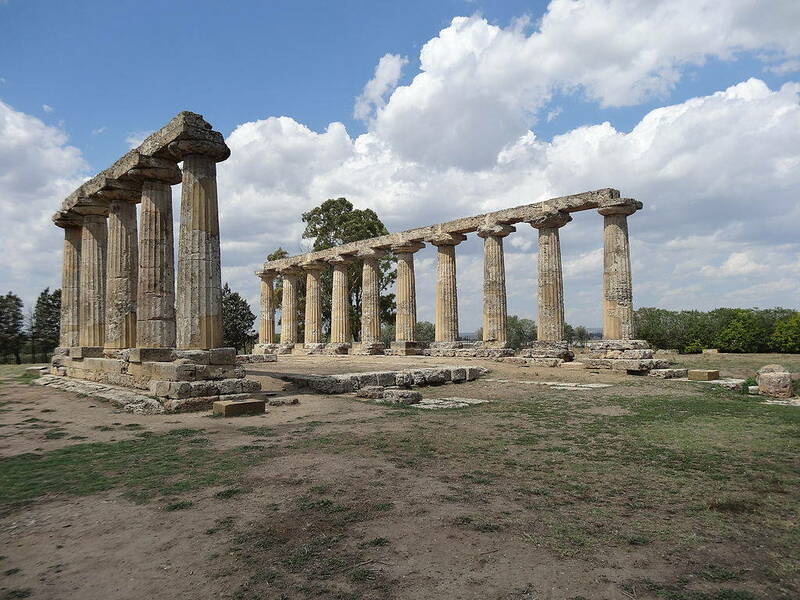 Here people have the opportunity to admire the beauty of the Tavole Palatine, a Theater, temples built in honor of Hera and Apollo, and an archaeological museum. We depart the lush plains of Metaponto to make our way to Matera, the last stop on our trip. The road runs opposite Bradano and past Montescaglioso, which we can see perched on a hill where Benedictine monks left behind a huge footprint in the form of a monastery the size of a city. A few miles on, we cross gorges, deep canyons carved by the water that passed this way ages ago. The Gravina, or Gorge of Matera, stands as a symbol of the geological origins of the Sassi, the extraordinarily unique monument of this beautiful city whose historic center is composed of dwellings carved out of rock dating back to prehistoric times. 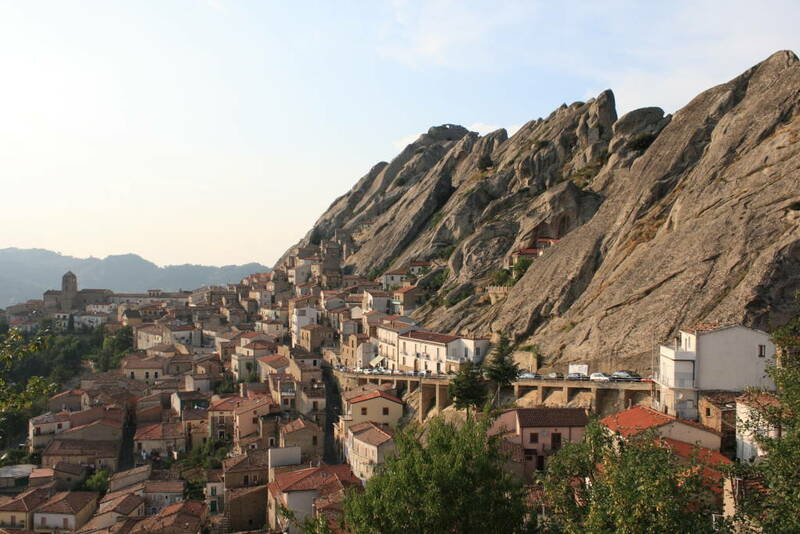 The Sassi, Caveoso and Barisano, have been dubbed UNESCO World Heritage sites and are propped up by either side of the gorge, which is split down the middle by an arterial road where the Duomo has been erected. The cave dwellings drop away layer after intricate layer. Trails dug into the bluffs lead to the gorge’s summit, over which the modern city has been built. Lived in till the 1950s and made famous by Carlo Levi’s 1945 novel Christ Stopped at Eboli, which he wrote while on the border, the Sassi were then “liberated” of their inhabitants, who were subsequently moved to anonymous buildings on the outskirts. It took decades to begin restoration of these extraordinary complex of “primitive” – yet surprisingly practical and economically arranged – dwellings. They say that monks from the Far East are responsible for the cenobes and rugged churches that dot Sassi di Matera. Their frescoes owe a debt to the Byzantines. The most important monument in Matera is the Duomo built in the 13th century in Apulian- Roman style. A beautiful door adorns the façade, as do a sumptuous rose window and other architectural gems. The inside has a Latin Cross plan with three naves and significant works of art. Other churches of note – San Giovanni Battista, Santi Pietro e Paolo, San Francesco, Santa Chiara, San Pietro Caveoso, Santa Maria de Idris, and others – stud o Caveoso, while in o Barisano the most highly regarded churches are Sant’Agostino, Santa Barbara, Santa Maria della Valle and San Pietro Barisano. In Gravina stands the church of Santa Maria della Colomba, known for its Roman façade and rose window. The clean up and restoration work has lured residents and businesses back to the i. 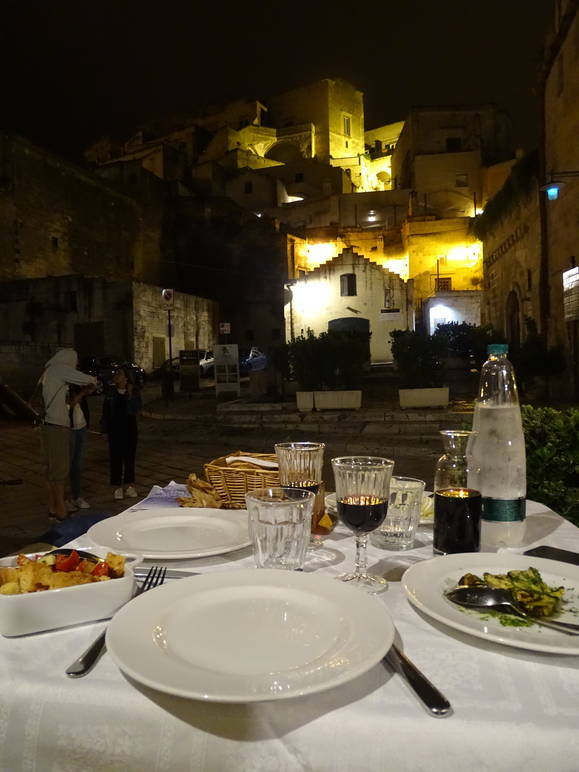 A special mention should be made of the hotel development project known as “Le Grotte della Civita,” — one of the most extraordinary destinations in the world, according to The New York Times. 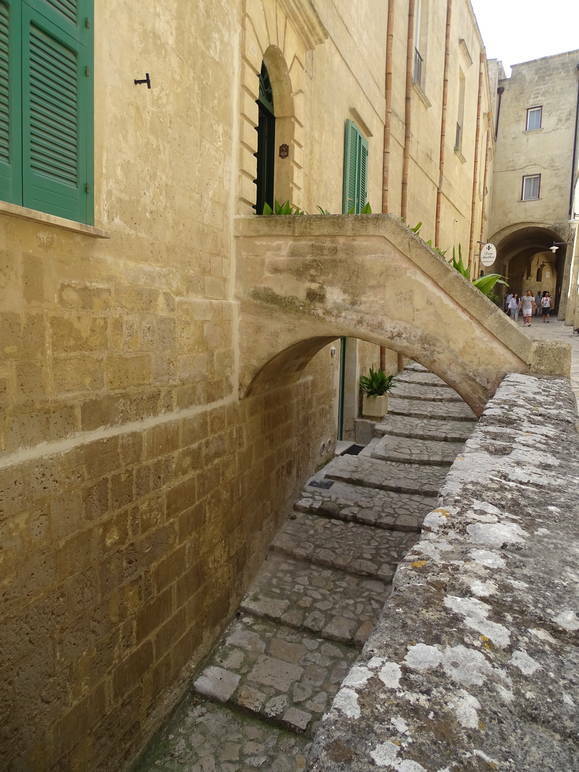 This, nevertheless, is only part of the huge effort made in recent years to resurrect the sassi, rehabilitate its buildings, restore the facilities and character of the city, and boost its cultural life. 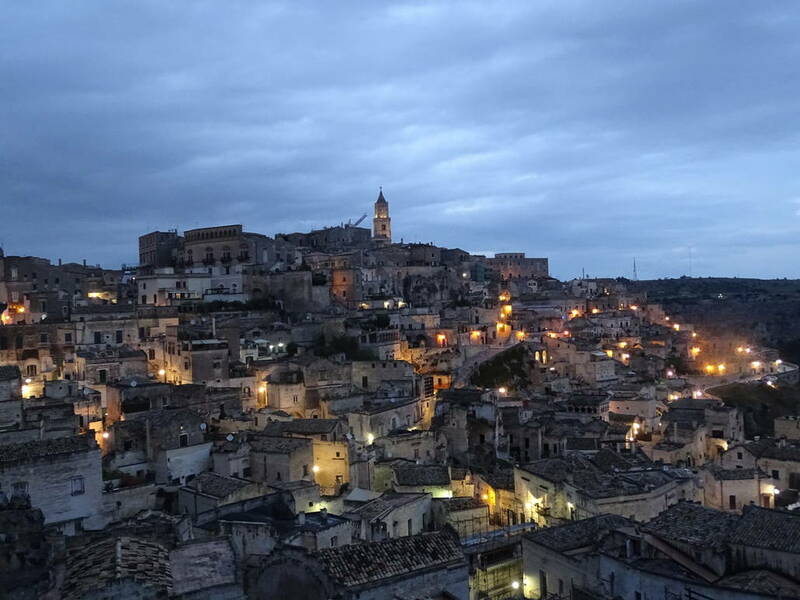 The overhaul helped Matera’s candidacy for European Capital of Culture 2019, for which it beat out other prominent Italian cities. All it took was highlighting the uniqueness of the city and its artistic heritage. Its selection as a European Capital of Culture has led to a major spike in tourism, further proof that investing in culture is the most concrete step toward developing Italy’s Mezzogiorno, brimming with natural beauty and artistic treasures to offer tourists. Goffredo Palmerini is a prolific writer and journalist, former deputy Mayor of L’Aquila and president of the Abruzzo chapter of ANFE (Associazione Nazionale Famiglie Emigranti), Goffredo Palmerini takes us to a fascinating journey from Abruzzo to Puglia, and now Basilicata.